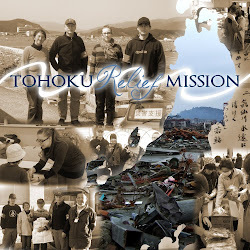 Today we visited 2 evacuation centers in Koriyama. One of the women that we talked to said that she had been here for over 40 days. We got to work together with the clowns from "Let's Party Tokyo" again, Yuki Kubota and Isamu Matsuoka, who are professional entertainers, and definitely gave the kids a good show. Here we are at Koriyama Seishounenkaikan, passing out the gifts that we brought with us. (We found that, as these evacuation centers are not in the same situation as those housing evacuees in tsunami-devastated areas, they are relatively well taken-care of in terms of food and every-day items. So we brought little gifts (the clowns from "Let's Party" brought many sponsored items for the children!!) such as these dolls. Here we are at Koriyama "Big Palette", which is kind sort of a "Makuhari Messe" of Fukushima. It was a massive building with huge halls and corridors, and people living in cardboard sections in every available area. Here, we received many requests for songs to sing when we come back. A few people came to us after our show was over and expressed regret that they hadn't requested this and that song that they would've loved to hear. One man requested "Country Roads", at the end of which he said, "Thank you for singing that song. We all want to go back to our beloved home town, so it has special meaning for us." (The evacuation centers in the Fukushima area house people who are unable to go back to their homes due to the catastrophe caused by the radiation leaks at nuclear reactors near the coast. In some cases, these people evacuated from the initial earthquake on March 11th, and have never been able to go back to their house to collect their things. Others were given more time before they had to move out, but in most cases did not know even half of the reality of the situation--which is that they might never be able to go back in their lifetime--when they left their homes and pets. Because of their unique situation, a lot of the evacuees in these centers are still incredulous and aggravated that such a thing has happened to them. That's why it was important to us to show our support for these people and to let them know that we sympathize with them during this emotionally turbulent time.